1 Evenly spread one side of 4 bread slices with 1/4 cup Hellmann's® or Best Foods® Real Mayonnaise. Combine remaining 1/2 cup Mayonnaise, eggs, jalapeño and cayenne in medium bowl. 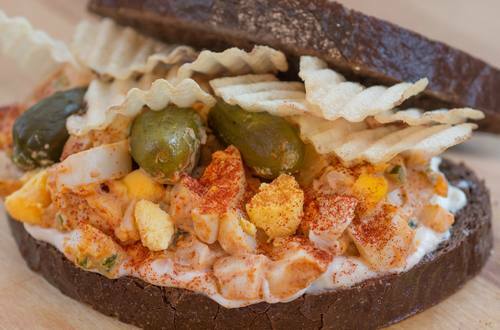 2 Top 4 bread slices with egg salad, then cornichons and potato chips. Sprinkle with additional cayenne if desired, then top with remaining bread.